A group of Syrian-Americans arrived at an academic conference at Lehigh University last week in Bashar al-Assad t-shirts and draped in Syrian flags adorned with Assad’s face. They repeatedly heckled and interrupted speakers, and one told an opposition figure that he deserved a bullet in the head. When a speaker showed a slide picturing dead Syrian children, they burst into loud applause. When another speaker cynically predicted that Bashar would win a 2014 presidential vote, they cheered. In the final session, they aggressively interrupted and denounced a Lebanese journalist, with one ultimately throwing his shoe at the stage. The panel degenerated into a screaming match, until police arrived to clear the room. This spectacle might seem notable in that it unfolded at a U.S. university, but otherwise it would pass for an alarmingly normal day at the office in today’s toxically polarized Middle East. Such intense mutual hostility, irreconcilable narratives, and public denunciations are typical of any number of highly polarized political arenas across the region. A similar scene between supporters and opponents of Egypt’s military coup is all too easily imagined — just add bullets. That’s why the disproportionate focus on sectarian conflict as the defining feature of the emerging Middle East seems dangerously misplaced. Sunni-Shiite tensions are only one manifestation of how a number of deeper trends have come together in recent years to give frightening new power to identity politics writ large. The explosion of Sunni-Shiite conflict in recent years has very little do to with intrinsic religious differences or with 1,400 years of Islamic history. It should instead be understood as an entirely typical example of identity politics, one in which sectarian differences happen to be the most easily available to politicians hoping to exploit them for cynical purposes. It looks much the same as the ethnic and religious polarization that ripped apart the former Yugoslavia in the early 1990s. 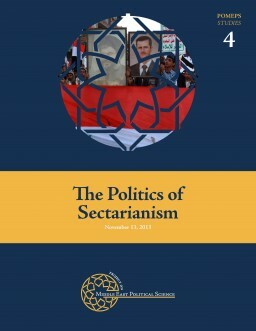 The sectarian polarization in Bahrain or Syria has followed very similar patterns to the Islamist-secularist polarization in Egypt and Tunisia. Responding to these sectarian tensions by embracing authoritarian states, focusing on religious authorities or exegesis, or promoting cross-sectarian reconciliation will miss the point. Today’s sectarianism is political to the core — even if it increasingly seems at risk of racing beyond the control of its cynical enablers. Interpreting Sunni-Shiite conflict as just another manifestation of a millennia-old conflict repeats a broadly essentialist position which tends to be the first resort every time ethnic or sectarian violence breaks out. Such approaches tend to focus on intrinsic, deeply rooted, and irreconcilable cultural differences between groups which can always pose a risk of escalation to violence (think Robert Kaplan’s Balkan Ghosts, which supposedly convinced Bill Clinton of the inevitability of Yugoslav ethnic slaughters). Evidence of decades of coexistence or intermarriage rarely impresses proponents of an essentialist approach. These differences might be latent for long periods of time, but given the opportunity — electoral mobilization, state failure, sudden explosions of local violence — people will tend to fall back on these deep identities. Such arguments tend to lead toward solutions involving the heavy hand of authoritarian states to suppress these supposedly inevitable violent tendencies, or toward partition into ethnic enclaves if state collapse has gone too far. That’s just what authoritarian regimes would like us to believe. But much more frequently, ethnic or sectarian violence is driven by either regimes themselves or by elites who cynically exploit identity for their political aims. These leaders might or might not truly believe in these differences, but they are perfectly happy to take advantage of them when it suits their goals. Often, it is the authoritarian regimes themselves that are most responsible for stoking and shaping the identity divisions. The Saudi regime, most obviously, systematically uses sectarianism in order to intimidate and control its own Shiite citizens at home and to combat Iranian influence regionally. Saudi leaders may or may not genuinely hate Shiites, but they know that sectarian conflict is a useful strategy. In Egypt, the Mubarak regime tolerated significant levels of intimidation and attacks on Coptic Christian citizens, while Abdel Fattah al-Sisi’s government actively stokes the demonization of Islamists to generate support for the new military regime. In Iraq, a stronger state under the control of Nouri al-Maliki is too easily used to protect Shiite privilege and repress Sunni opponents. Strong states are often the problem, not the solution. The strategic mobilization of identity politics typically involves some common moves. Electoral systems can be designed to maximize sectarian or ethnic competition, force voters into identity-defined voting blocs, and hinder cross-identity coalition formation. Discrimination in state institutions, military recruitment, and patronage can entrench hostility along particular lines and not others. For sectarian entrepreneurs from Slobodan Milosevic to Abu Musab al-Zarqawi to triumph, intermarried families must be ripped apart, the possibility of coexistence undermined, and moderate counterparts knocked down in favor of more frightening extremists. Televised slaughter, rumors of sectarian or ethnic targeting, and the wide circulation of hostile rhetoric are a benefit, not an unfortunate side product of their efforts. Often, the real purpose of such strategic identity mobilization is intra-group competition, as ambitious leaders see sectarian or ethnic extremism as a useful way to attack their political rivals as weak, naïve, or duplicitous. Attacking Shiites is often a product of competition among different Sunni factions as much as it is driven by larger religious struggles. More venom is often directed toward moderates within one’s own group than toward the putative enemy; as the dwindling cohort of true Egyptian liberals can attest, anyone who might try to seek the middle ground and critique both sides will be viciously shouted down. That, in turn, pushes more and more people to either silently accept or even to vocally repeat the mythologies supporting this mobilized identity, no matter how absurd. Uncertainty, fear, economic hardship, and violence often create the toxic conditions for identity mobilization to gain traction. It’s endlessly useful to demagogues and dictators to have some minority to blame for problems, to deflect outrage from their own failures, and to bind an otherwise fractious community together against a common enemy. And that’s where the proliferation and entrenchment of sectarian rhetoric over the previous decade have been especially destructive. The sectarian incitement which pollutes official and private media outlets alike, and which floods through politicized mosques and religious networks, provides the master frame which increasingly makes sense to people who a decade ago would have angrily waved such rhetoric away. And after a decade of civil war in Iraq and propaganda about an Iranian-led “Shiite Crescent” threatening the Sunni Muslim world, those narratives are now deeply entrenched and hard to change. Language and terms that once sounded exotic and strange now find wide public circulation and resonance. The Arab uprisings introduced such uncertainty and fear not only within countries such as Syria, but across the entire region, as do recent memories of very real slaughters, displacements, and outrages — such as those that have scarred Iraq. Syria provided endless opportunity for local entrepreneurs to use sectarian language and imagery to build support and raise money for the insurgency. Increasingly polarized, insular media clusters within which only information supportive of sectarian narratives tends to circulate, reinforces and intensifies identity conflicts with every YouTube video. And those atrocities have been experienced vicariously across the region, with Egyptian or Tunisian Sunnis identifying with the suffering of their Syrian or Iraqi counterparts even if they did not themselves have much direct contact with Shiites. Highlighting the role of cynical politicians in the mobilization of identity conflict points to very different policy advice, of course. Fighting sectarianism thus requires changing the incentives and the opportunities for such political mobilization. Were electoral rules changed, official media and state institutions purged of sectarian language, and hate speech and incitement punished rather than encouraged, identity entrepreneurs would suffer political defeat. Elites who want to cynically manipulate sectarianism need to have the raw material with which to work or the right conditions within which to work their evil magic. Taking the oxygen out of the room is not impossible: Kuwait, for instance, turned away from sectarianism in its last elections, in part as the costs of such conflict began to really sink in. But such political responses to identity conflict become far more difficult after they have been successfully mobilized — especially under conditions of state failure, uncertainty, violence, and fear. It is far easier to generate sectarian animosities than it is to calm them down. This ratcheting effect is the reason for the deepest concern about the trends of the last few years. Identity entrepreneurs may think that they can turn the hatred on and off as it suits their interests, but at some point these identities become self-sustaining and internalized. Blood matters, a lot: There will be no reconciliation in Iraq or Syria for a long time, not with so many individuals who have watched people they love slaughtered or raped or displaced over their ascribed identities. How could anyone expect an Iraqi Sunni to forgive or happily coexist with Shiite neighbors who only recently killed his children because of their religion? Those memories are only reinforced by the endlessly circulating videos and images which today provide unavoidable documentation of additional atrocities. Even ending the violence and restoring a modicum of stability in Syria, Iraq, or Bahrain is not likely to erase these inflamed hatreds and memories, leaving well-fertilized terrain for the next identity entrepreneur who comes along. The political approach to sectarianism makes painfully clear that it did not have to be like this. Sectarian conflict is not the natural response to the fall of a strongman. The Bahraini activists who demanded political reform and human rights did not have to be tarred as Iranian assets and smeared as Shiite separatists. Syrian non-violent activists could have developed and enforced a compelling vision of a non-sectarian post-Assad alternative. Gulf Islamists and regimes could have opted not to use sectarianism to generate support for the Syrian insurgency. The Egyptian Muslim Brotherhood and its enemies could have opted for cooperation and inclusion rather than spiraling polarization and confrontation. But this approach also offers little optimism about the future. The painful reality is that sectarianism proved too useful to too many powerful actors, and too compelling a narrative in a violent, turbulent, and uncertain time, to be avoided.